Relic Hunter - FREE SHIPPING! The Relic Hunter is one of the most exciting products we ever developed. 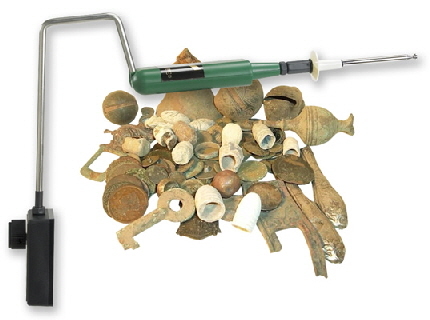 Designed to locate ferrous and nonferrous metals, it can quickly scan large tracks of land to locate historical artifacts such as military accessories; including minie balls, swords, buckles, buttons and coins. Included with each Fieldscope is a field holster, instructional manual, DVD, and 2 antennas. All compartments are sealed to prevent dust, dirt or moisture from entering any sensitive components.